Good friend Hilary has recently been converted to raw eating and is now aglow with health - and boy, was she sick! Read about it on her blog (see below). We have been treated to her new (not)cooking and it is all divine. She doesn't use anything but vegetables, seeds and nuts, some nori, she makes noodles from zucchini. 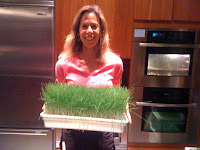 She got lots of new toys and gadgets and is growing wheatgrass in her elegant kitchen. The fates seem to conspire because our newest author (we're publishers) is a cool old dame who just made her first skydiving jump (see youtube video- link below). She has spent 70 years being a vegetarian and most of that as a raw foodist. 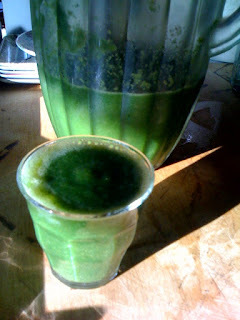 We were visiting her on Sunday and she gave us each big doses of what she has for breakfast, green juice. I have never been a big juicer or even smoothie-er (something about the banana thing),but when an 82 year old beautiful woman hands you something to drink from her fountain of youth, you drink. It wasn't awful or even bad, it was even kinda good. We went home and pulled out of the refrigerator kale, cucumber, carrot, celery, ginger, a pear, lemon and some pear cider. Threw it all into the blender. This is a picture of the beautiful colored stuff that was wrought. It is pulpy but I do not mind that. We drink it for breakfast ...and whenever we feel like it cause it can't be bad, it just can't. I discovered your blog by discovering Hillary's. Glad you're doing smoothies. Use less hard veggies and more liquid for more smoothness. A cup of pure water added might do the trick. CAn't wait to get started with you guys!